Prominent & Leading Manufacturer from Kurukshetra, we offer awning wooden window. 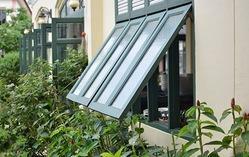 Awning windows are commonly referred to as crank windows, since they are opened using a cranking mechanism. The two window types easily glide open or shut by turning an easy-to-reach fold-down handle. Both are very similar in style, but have two distinct differences. Awning windows are hinged at the side and open outward, to the left or to the right. They are available in one, two, three, four or five-lite configurations. Awning windows are made for openings in which the height is greater than the width. However, awning windows are hinged at the top and are only available in one, two or three-lite configurations. Awning windows are made for openings in which the width is greater than the height.